There’s little doubt Rand’s Marina has rocketed up my list of favorite spots to photograph. 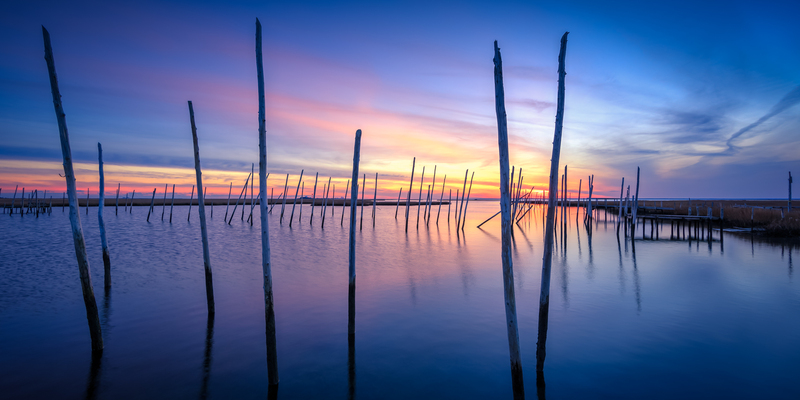 The cedar pole and bay water combination provides plentiful foreground opportunities, and it’s compositionally strengthened with derelict dock remnants in the middle ground backlit by marsh, clouds, and sky background. It’s just a great space for making landscapes. While this shot was made Monday, December 5, 2016, I didn’t have enough time to get it posted until today. Preparations for a long, exciting week with the day job took precedence; laundry must be done, and bags must be packed, ya know? But now that I’m back home I’ve got time to properly blog it up. Looking forward a bit, it’s getting to that time of year where I’ve got to start thinking about selecting 12 shots for my annual best of—due out December, 24, 2016. The past two years its proven to be a fun retrospective of a year’s week. It’s proven a great way to benchmark where I’ve come from so I can calibrate where I’d like to get to. Beyond that, I’ve gotten my hands on a Pulse Camera Remote from Alpine Labs—it’s charging now!—and I am eager to broaden my horizons through the world of time lapse. For years I’ve been wanting to explore this road but I never pulled the trigger on an intervalometer. Finally that time has come. Now I just need to figure out what I’m doing. . .